This piece of lamb from Hallingskarvet products, weighing 750 gr / 1 1/2 lb, was expensive. At a price of €20, I expected more quality. But before I get into detail of the quality of the meat, let me tell you how to prepare a lamb roast to perfection. Lamb should rather be slightly undercooked, in order to stay moist and tender. Wrap the lamb in thin slices of bacon, and fry it in a very hot pan with a little olive oil, then roast in the oven on a low heat (120C / 250F) for 45 minutes. 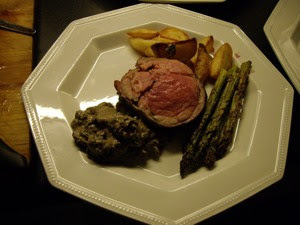 I used frozen, ready made potatoes and asparagus, roasted in a hot oven (210C / 400F) for 25-30 minutes. Put the roast in the oven for 15 minutes, allow to rest for five minutes before cutting into thick slices. I served a sauce made with morels, creamed champignon, single cream, salt, pepper and 2 cl. cognac. Sadly, in spite of the tempting labels, this meat was extremely tough, and hardly possible to eat. For this price I had really expected much better quality, so if you see this label in your shop, be aware that you may spend your money on a better cut of meat. The rest of this lamb will end up in a lamb stew that I will make today, and boil for a very long time! !